non-GMO, free of dairy and soy, and is Vegan. Founded in 1922, Jamieson is Canada’s leading branded manufacturer, distributor and marketer of high quality natural health products. Daiya is the leading brand of plant based, allergen free foods. 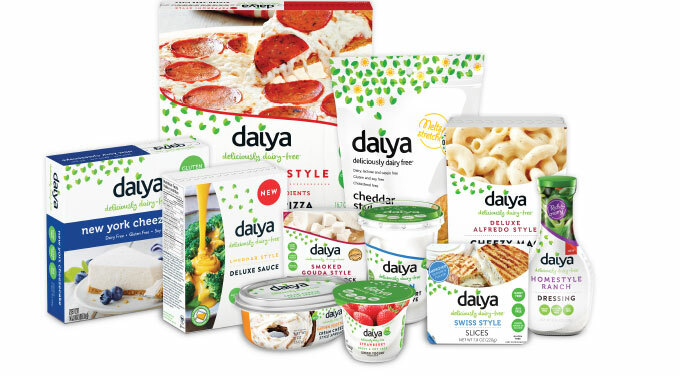 Daiya is the #1 brand of dairy free cheese, has a rapidly growing frozen pizza product line, and exciting new product introductions that expand the Daiya brand across the store, including cheese cake, macaroni and cheese, and dairy free yogurt. Acquired by Otsuka Pharmaceutical in July 2017. Airborne® is a leading line of innovative dietary supplements that support immune health. Airborne was created by a school teacher to help support her immune system and is comprised of a proprietary blend of 17 vitamins, minerals and herbs. Acquired by Schiff Nutrition (now Reckitt Benckiser) in April 2012. Blinc is a leading line of eye beauty and other innovative products for the spa, salon and prestige beauty channels. Blinc is the pioneer of mascara that “Tubes Your Lashes”. Charter Baking is the leading organic bread and baked goods company in the U.S. It’s Rudi’s Organic Bakery® brand is the leading national brand of organic bread and a leader in gluten free products. Acquired by The Hain Celestial Company in April 2014. Is a leader within the consumer wellness category. The products in Amerifit’s portfolio include OTC and nutritional supplement products and have leading market positions within their respective categories. Now called I-Health, Amerifit was acquired by Martek Biosciences (now part of DSM) in January 2010. In the Spring of 2009, Stockton Road Capital sourced an opportunity to buy Airborne, the iconic brand of immune support products. At the time, Airborne was under-performing due to negative PR from an FTC action against the brand, and poorly executed line extensions that had been oversold into retail accounts. Yet at its core, Airborne was a strong brand equity with an excellent core product that was widely beloved by consumers. According to a representative at a major Club retailer, Airborne was the #1 selling item in their pharmacy section. In October 2009, GF Capital, Stockton Road Capital and Management bought the business. Marti Morfitt became CEO. During the course of the investment, the company’s supply chain was simplified, which increased profitability and freed time and resources to focus on sales and marketing. Underperforming line extensions were discontinued and the brand was brought back to its core product. Ineffective advertising execution was redone with consumer tested advertising, and marketing investment, which had been severely cut during the brand’s recent turmoil, was restored. New sales leadership re-established credibility with retail partners that the Company was a data driven partner that would follow through on execution. Those basic building blocks in place, the group began to invest materially in consumer research to unlock insights to better reach consumers and what new products would appeal to consumers of the brand. A vision was created to become the retailer’s partner in building a comprehensive line of credible immune support products. A disciplined multi-year new product development program to support this vision was put into motion. In early 2011, the ownership group was approached by the banker for Schiff Nutrition about buying the Brand. The transaction was closed in April 2011. The proceeds received in the transaction represented approximately 5.5x the ownership group’s original investment in approximately 2.5 years time. Over that timeframe, Airborne had gone from an unprofitable, declining brand with credibility issues, to a brand that was very profitable and growing double digits with a multi-year pipeline of new products to support a broader vision for the brand. The employees of Airborne had nearly doubled and everyone felt great pride in the Company and its accomplishments. Stockton Road played a key role in this success from the initial transaction sourcing and investment insight, investment due diligence, strategic advice and Board governance, and a significant role in the materialization of the exit to Schiff. In 2014 a leading Canadian pension fund engaged Stockton Road Capital to help them explore the acquisition of Jamieson Laboratories knowing SRC to be an accomplished investor in Health & Wellness. Jamieson is the #1 brand of nutritional supplements in Canada. During the course of their joint exploration, the pension fund decided that the Company’s potential need for select managerial turnover was not of interest. Joe had however earned the respect of Jamieson’s founder & Chairman and told him of his continued interest and ability to deliver a transaction. He entrusted Joe to find another partner. Joe had previously partnered in an investment with one of the Partners of CCMP Capital, a world-class private equity fund based in New York. Given their close relationship, it was an easy call to a friend and CCMP immediately appreciated the opportunity for a proprietary opportunity of this quality in the attractive nutrition space. Later that year CCMP bought 100% of Jamieson in an LBO with Stockton Road as its co-investor partner. Over the next several years the management team of Jamieson was significantly enhanced and the Company’s category and channel presence was expanded through several acquisitions. The Company’s core supplements line continued to solidly grow while cost efficiencies were also realized. And an exciting international growth strategy was developed. In July 2017, Jamieson went public on the Toronto Stock Exchange under the symbol JWEL. In 2014, the Board of Directors of Daiya Foods engaged Stockton Road Capital as strategic advisor to the Company and strategic consigliere to CEO, Terry Tierney. The Company had to that point been self-funded by its founders and a local community of angels and individual investors. Daiya was a fast-growing vegan cheese company that had recently diversified into the frozen pizza category. Diaya’s core brand promise was products free of key food allergens gluten, dairy and soy. The Company had just recently turned profitable. A year later, the founders of the business turned to Stockton Road to arrange an investment to provide them with a level of desired liquidity to allow them to be patient for a realization at a more opportune time in consideration of the broader shareholder base. Stockton Road partnered with Northwood Ventures on the transaction and completed it with minimal disruption to the business given Stockton Road’s existing deep knowledge of the business and trusted relationship with Northwood. Stockton Road assisted the Company’s efforts to expand into numerous categories including frozen pizza, macaroni and cheese and yogurt (among others), proving the Daiya brand could be a master brand for the category. During this time, the core non-dairy cheese line became the market leader, and the positioning of the brand was expanded to the larger plant-based foods category. In 2017 Daiya was sold to Otsuka Pharmaceutical of Japan for $C405 million, which plans to develop a worldwide food business with Daiya as the core platform. © 2017 Stockton Road Capital. All rights reserved.